This is as cozy as it gets. 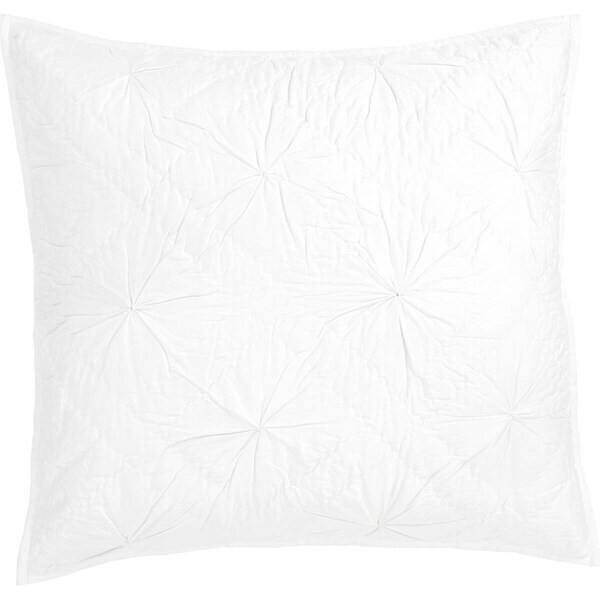 The Aubree Parchment Euro Sham is double diamond hand-quilted soft parchment cotton satin for a luxurious hand. In the center of each diamond is a gathered effect for added visual appeal. Reverses to solid parchment cotton satin and 3 tie closures. Manufacturer Country: India. Care: Machine wash in cold water with like colors, gentle cycle. No chlorine bleach. Tumble dry low, remove promptly. Iron if needed. Double railroad hand-quilting on soft parchment sateen fabric. Reverses to solid parchment cotton satin fabric. Dimensions: 26"H x 26"W, Weight: 0.6 lbs. Material: 100% cotton shell, 100% cotton batting. Center of every diamond is gathered. Straight edge with .5" parchment binding. Features 3 tie closures with 3" overlap to conceal pillow insert. Single fabric: Hand-quilted, Machine stitched. Color: Parchment - parchment.